That’s the situation I’m in. I have but one shelf to fill with Lego goodness, so to build something new I have to demolish something else. That’s cool though – this is one of the things I love about Lego – its Lucretian atomic structure means we can reduce a build to its basest elements (sort them furiously) and recombine them into something new and glorious. It’s my birthday week I “have” to construct my Lego Jabba’s Palace and that’s going to take up some space. Plus dear friends were kind enough to indulge my love of Lego by giving me Superman vs Power Armour Lex Luthor (6862), Atlantis Deep Sea Striker (8076),Republic Assault Ship & Coruscant (75007) and LOTR The Wizard Battle (79005)! 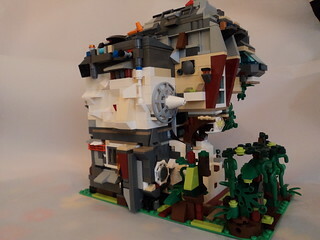 I decided to take apart one of the first things I stumblingly built when I bought a massive box of second hand Lego – Boba Fett’s House which I wrote about building here. It was fun to build – one of those rambling creations that emerges organically without intent. It was equally enjoyable to take down. I got a chance to see how I could have done things differently and still to be pleased about how unusual bricks fit together. I thought I’d record the demolition in poor quality video for my own amusement, and possibly someone else’s. It is of course, sped up – no one should waste an hour watching me and my cat separate bricks! Or watch it here if the showy videoy thingy doesn’t work for you. Music is by Mr & Mrs Smith. My delightful other half has been taunting me for a while about having visited Lego Shops in Manchester and Leeds this year. She filled a milkshake pot with Lego and hid it from me until my birthday. Now it is mine, all mine! Apparently the staff in the shop were genuinely impressed by how much she managed to pack into the tub – it is dense and barely moves when shaken. Marilyn knows how much I love the stuff and especially the lovely pastel colours of Lego Friends, so there’s tonne of the lime green, pink, orange and yellow. I should have enough to actually build something now. The base of the tub is cunningly filled with beautiful pink and green tiles and lots of those 2×2 tiles with a centred stud. Oh, and grey 2×1 tiles with dials on! There are also a few dozen bricks with studs on all sides for SNOT joy, random flowers, transparent orange 1×1 slopes (! ), column pieces, foliage (in lime green) and a gazillion round studs at the top. Hidden in there too are a black witch hat, a lollipop and some other irregular pieces. I shall take great pleasure in using these birthday bricks prettily. Marilyn also made me nine very cool custom minifigures! I believe they deserve a showcase and post all of their own – probably next week. You can see all the pictures in glorious colour here on Flickr.